Space is at a premium in Manhattan. It’s at a premium in LOTS of places actually, but Manhattan is where my wine collection and I live. My wine glasses live there too, obvs. And over the years, I’ve amassed quite the collection. You never know when you’ll need 12 champagne glasses – I’ve had it happen! And I was ready! However, I’m lucky enough to have that rare apartment dweller’s unicorn known as a “spare closet”. Hence, I can house 12 champagne glasses that get used once a year. (You guyyyys, I’m living my BEST stemware life right now!) Most people do not. So this week, we’re going to discuss the THREE (that’s right, only 3) styles of stemware you’ll ever need to be ready to serve your guests in style, plus a couple bonus styles to consider if you have the space. Overview: There’s honestly an endless array of shapes and sizes for wine glasses, each with a specific reason for their style. For example, champagne flutes are tall and skinny to bring those bubbles to the top and stimulate the fizz-loving senses, while a champagne coup is round and wide, allowing you to pick up the nose of your champagne and enjoy more of the flavor. Same drink – two shapes – two agendas. But you probably don’t need both. 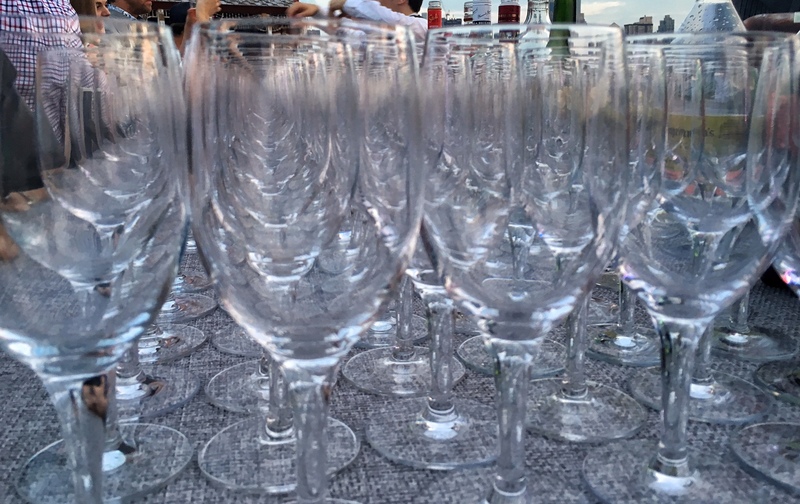 Be realistic in your stemware choices – unless you’re opening a sommelier academy, no one needs them all. It’s the style generally sold as “red wine glass”, with a generous bowl, long stem, and a slightly tapered top. The glass is shaped that way to allow air in and aroma out, making for a lovely swirl and sniff moment for the drinker. While there are many sub-genres of red wine glasses, each slightly different, this one style will adequately serve any red and still allow the wine to breathe and blossom as it is enjoyed. This glass has a shorter stem than our do-it-all above and a wider bowl. The glass tapers visibly at the top, creating an almost trapezoid silhouette. As with the powerhouse above, this is usually labeled “white wine glass”, with a rather wide mouth, but tall and shallow bowl. The stem is long and, aside from champagne flutes, this glass will likely be the tallest you own. Any white wine will happily share its fresh, crisp goodness and refresh your palate in this glass. As I mentioned earlier, champagne flutes are tall and thin on a long stem, meant to showcase the bubbles as they rise and tickle the drinker’s nose. A champagne coup is short and round with a wide mouth, meant to let the actual wine itself show off nose and flavor, even if the bubbles escape without much show or nose tickle. Again, you don’t need both, and you don’t even need a classic round-bottomed flute. Squareish champagne glasses are modern and easier to fit into smaller spaces by alternating top/bottom positions without wasted shelf real estate. These are your splurge-worthy, lead crystal, super special occasion glasses that dreams are made of, and who wouldn’t want to pop a bottle of bubbly and toast a new job, a new house, a baby on the way, etc. etc., with some statement stemware! Find a pair you love, and the occasion will come. And there you have it. These three glasses are all you need, plus some bonus ideas! Have space? Get them all! Then post a picture in the comments to show off your collection! Previous There is no off-season. I’m officially starting the move into a smaller (but better located!) apartment on Saturday and this is one thing I’ve been hemming and hawing over! I’m trying to Marie Kondo my kitchen in the transition, but let’s be real, wine ALWAYS makes me happy. Thank you for the advice!